J.M. 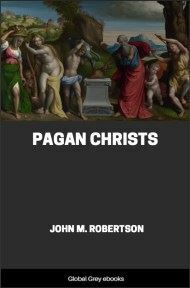 Robertson herein challenges not only the historical authenticity of the canonical accounts of the founding of Christianity, but also Buddhism, Hinduism, Jainism, Zoroastrianism, and Judaism. 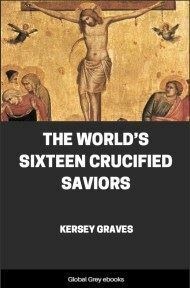 He answers the question implicit in Kersey Graves' 1875 creed, The World's Sixteen Crucified Saviors. Why so many similar stories of savior figures in world religion? It seems probable, despite theological cavils, that Petronius was right in his signal saying, Fear first made the Gods. In the words of a recent hierologist, "we may be sure that primitive man took to himself the credit of his successful attempts to work the mechanism of nature for his own advantage, but when the machinery did not work he ascribed the fault to some over-ruling supernatural power.....It was the violation of [previously exploited] sequences, and the frustration of his expectations, by which the belief in supernatural power was, not created, but first called forth." The fact that this writer proceeds to repudiate his own doctrine is no reason why we should, save to the extent of noting the temerity of his use of the term "supernatural." There are some very strong reasons, apart from the à priori one cited above, for thinking that the earliest human notions of superhuman beings were framed in terms of fear. Perhaps the strongest of all is the fact that savages and barbarians in nearly all parts of the world appear to regard disease and death as invariably due to purposive hostile action, whether normal, magical, or "spiritual." Not even old age is for many of these primitive thinkers a probable natural cause of death. If then the life of early man was not much less troublous than that of contemporary primitives, he is likely to have been moved as much as they to conceive of the unseen powers as malevolent. "On the Gold Coast," says a close student, "the majority of these spirits are malignant......I believe that originally all were conceived as malignant." And how, indeed, could it be otherwise? Those who will not assent have forgotten, as indeed most anthropologists strangely forget when they are discussing the beginnings of religion, that man as we know him is descended from something less human, more brute, something nearer the predatory beast life of fear and foray. 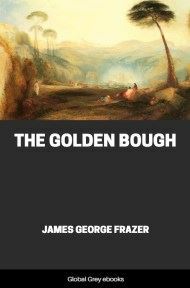 When in the period of upward movement which we term civilisation, as distinct from animal savagery, there could arise thrills of yearning or gratitude towards unknown powers, we are æons off from the stage of subterhuman growth in which the germs of conceptual religion must have stirred. If the argument is to be that there is no religion until man loves his Gods, let it be plainly put, and let not a verbal definition become a petitio principii. If, again, no numina are to be termed Gods but those who are loved, let that proposition too be put as a simple definition of term. But if we are to look for the beginnings of the human notion of numina, of unseen spirits who operate in Nature and interfere with man, let it be as plainly put that they presumably occurred when fear of the unknown was normal, and gratitude to an Unknown impossible. 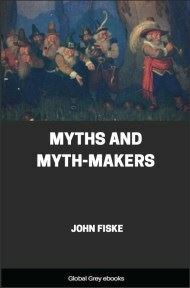 But in saying that fear first made the Gods, or made the first Gods, we imply that other God-making forces came into play later; and no dispute arises when this is affirmed of the process of making the Gods of the higher religions, in their later forms. Even here, at the outset, the play of gratitude is no such ennobling exercise as to involve much lifting of the moral standpoint; and even in the higher religions gratitude to the God is often correlative with fear of the evil spirits whom he wards off. This factor is constantly present in the gospels and in the polemic of the early Fathers; and has never disappeared from religious life. 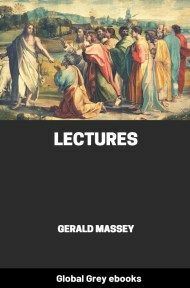 The pietist who in our own day pours out thanks to "Providence" for saving him in the earthquake in which myriads have perished is no more ethically attractive than philosophically persuasive; and the gratitude of savages and barbarians for favours received and expected can hardly have been more refined. It might even be said that a cruder egoism presides over the making of Good Gods than over the birth of the Gods of Fear; the former having their probable origin in an individualistic as against a tribal instinct. But it may be granted that the God who ostensibly begins as a private guardian angel or family spirit may become the germ of a more ethical cultus than that of the God generically feared. And the process chronically recurs. There is, indeed, no generic severance between the Gods of fear and the Gods of love, most deities of the more advanced races having both aspects: nevertheless, certain specified deities are so largely shaped by men's affections that they might recognisably be termed the Beloved Gods. It will on the whole be helpful to an understanding of the subject if we name such Gods, in terms of current conceptions, the Christs of the world's pantheon. That title, indeed, no less fitly includes figures which do not strictly rank as Gods; but in thus widely relating it we shall be rather elucidating than obscuring religious history. Only by some such collocation of ideas can the inquirer surmount his presuppositions and take the decisive step towards seeing the religions of mankind as alike man-made. On the other hand, he is not thereby committed to any one view in the field of history proper; he is left free to argue for a historical Christ as for a historical Buddha.